Ecology “proper” is currently limited in addressing human habitation. It doesn’t usually incorporate the theory or methods of fields like economics, anthropology, political science, sociology and history. Many subfields have emerged in answer to the need for more detailed study of human-environment interaction, including human ecology, cultural ecology, political ecology, environmental sociology, historical ecology, ecological anthropology, ecological economics and ecological urbanism. But most are not closely integrated with mainstream ecology and its methods, which are primarily focused on nonhuman nature. Many ecologists portray human environmental impact as a kind of alien intervention into the natural world, and don’t attempt to understand the political, social, economic and cultural processes through which it takes place. Sigrist isn’t entirely wrong—our understanding of the natural world must consider human impacts. The thing is, many ecologist already do that. If Sigrist had written this decades ago, I would concede his point. But times have changed. No serious ecologist draws a firm boundary between natural and anthropogenic spheres. For years, ecologists have widely acknowledged that no part of the Earth is untouched by human influences. Some may still cling to the old distinction between human and wild, but they are increasingly few and far between. Climate change has thoroughly disabused most of that notion. Incorporating useful elements of cultural landscape, urban political ecology and ecological urbanism can make ecology more attuned to the ways humans experience and influence cities. This is more than a shared analytical framework or conceptual lexicon (Gandy 2008: 567); it means actual integration so that ecologists are equipped to address the full complexity of human environmental relations and help make cities more just, healthy and beneficial to the planet as a whole. To say too few ecologists study human-environment interactions isn’t just unfair, it’s incorrect. Sigrist seems to misunderstand ecology and its relation to the myriad subfields he listed above. The ecologists he describes—the ones that focus on strictly “natural” ecosystems—aren’t members of an umbrella field but a subfield. They’re just one type of ecologist. The people who study other subfields of ecology? They’re ecologists, too. What Sigrist is proposing for ecology already exists. Perhaps he wants ecologists to avoid over-specialization.¹ Perhaps what he means to say is that there needs to be more collaboration and cross-pollination between ecologists of different subfields. He’s not wrong—there could always be more. But he’s ignoring what’s already out there. I know ecologists of all stripes—field, physiological, sociological, and so on—who collaborate with environmental historians, economists, even electrical engineers. I know ecologists who write papers about the value of ecosystem services, how to use Wall Street’s data processing techniques to understand the water cycle, or how spirituality can affect the conservation of biodiversity. Hell, I’ve been to conferences where ecologists have wrung their hands about how ecology needs more collaboration. If anyone is conscious of the need for interdisciplinary collaboration, it’s ecologists. After all, ecology is the original interdisciplinary science. Again, that’s not to say we shouldn’t work harder to identify how humans are affecting the natural world. I’m the last to argue against that. But we need to identify our shortcomings where they actually exist, not where we imagine them to be. 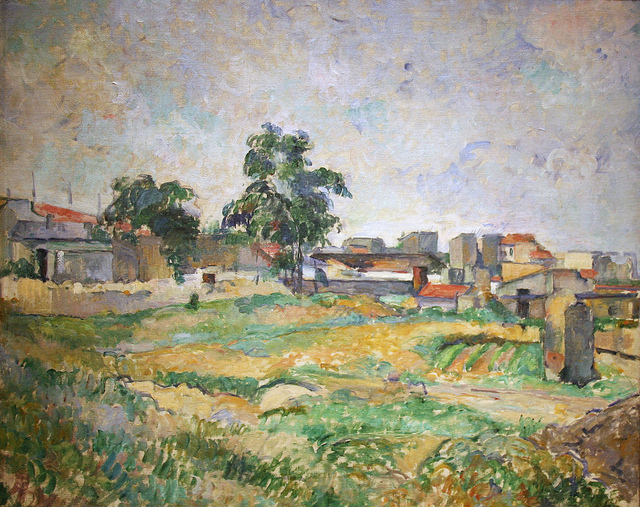 Landscape near Paris, Paul Cézanne, National Gallery of Art.